Kiev's reaction has jeopardized the OSCE’s efforts to start an inclusive national dialogue in Ukraine, the Russian Foreign Ministry said in a statement. 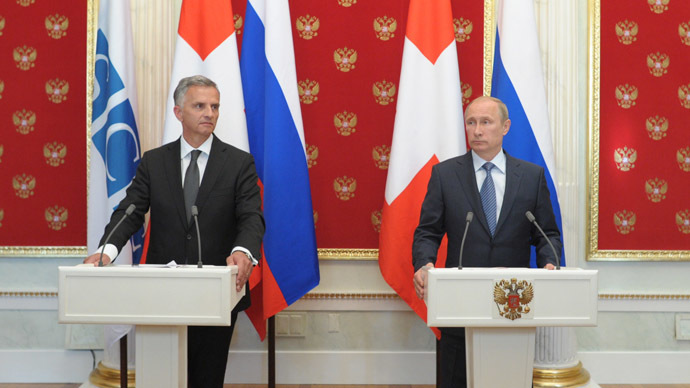 "Reaction to the results of the Putin-Burkhalter meeting is a matter of deep concern as it effectively puts into question the prospects of the OSCE's efforts to launch an inclusive national dialogue,” Lavrov said in a phone call with his German counterpart, Frank-Walter Steinmeier. “Lavrov stressed that President Putin's call to representatives of southeast regions of Ukraine, supporters of federalization, to postpone the May 11 referendum, creates favorable possibilities to start substantive dialogue, including the OSCE roadmap of the settlement of the Ukrainian crisis proposed by the Swiss chairmanship of the OSCE,” Russia’s Foreign Ministry said. The international community “in general” positively reacted to the negotiation’s results in Moscow, Russia’s Foreign Ministry stressed, adding that Moscow considers this a good sign and evidence of the international community's interest in solving the Ukrainian crisis. “But from Kiev, there were only phoney attempts to make snarky remarks by Arseniy Yatsenuk. From the side of Ukraine’s Foreign Ministry, there were obscure statements that without Ukraine no one can discuss political deadlock in this country,” the ministry said. Moreover, Kiev's reaction bluntly contradicts the agreement reached in Geneva, the foreign ministry noted. “Such a position is in direct conflict with the fundamental principle of the Geneva Declaration, which begins with the requirements of the termination of any use of force,” the ministry said. On Wednesday, acting Ukrainian PM Arseniy Yatsenyuk expressed dismay that the crisis was discussed in Moscow without representatives from Kiev or its allies, the US and the EU. 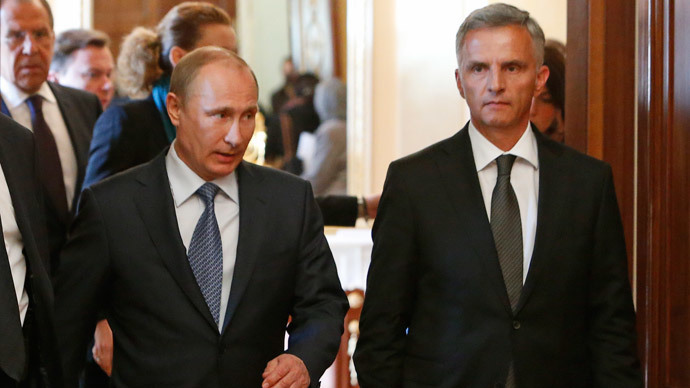 He expressed hopes that the OSCE, which came up with its roadmap, will accept Kiev’s plan of action that was proposed shortly after talks between Putin and Burkhalter in Moscow. 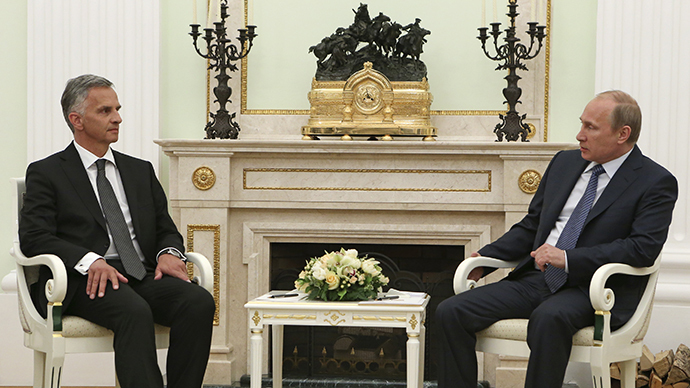 Yatsenyuk said the plan was worked out by the country’s acting Foreign Minister Andrey Deshchitsa. He proposed organising “national unity roundtables” with “representatives of all political forces from all regions and civil society” and expressed hope “OSCE experience” will help in organizing such gatherings. The US State Department was quick to support the idea of “roundtables” as a means of defusing tensions in Ukraine, with deputy spokesperson Marie Harf telling foreign journalists at a briefing she hopes such discussions will help Ukrainians decide their own future, Itar-tass reports. At the same time Kiev opted to ignore calls from President Putin to stop the military operation in the southeast of the country. “The counterterrorist operation will go on regardless of any decisions by any subversive or terrorist groups in the Donetsk region,” Andrey Parubiy told reporters in Kiev.